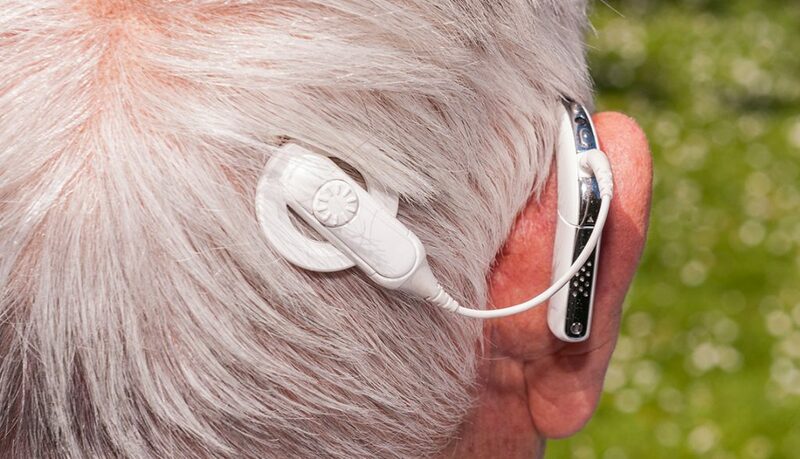 With the right device programmed correctly, most people with hearing loss get significant benefit from hearing aids. Hearing aids include advanced sound processors providing amplification and a host of other tailored features, all packed into devices small enough to fit inside ears or discreetly behind them. However, when the nerves of hearing are damaged in a way that affects sound clarity, not volume, the benefit hearing aids can provide can be limited. Simply making unclear sounds louder is not particularly helpful. In these cases, Cochlear implants are worth considering. Cochlear implants are incredible devices that both process sound and send sound signals to the brain, substituting for the damaged hearing nerves. In some cases, an additional acoustic component also delivers amplified sound to the ear canal (6). The sound is then transmitted along the normal auditory pathway – from the outer ear to the middle ear and inner ear. In other cases, the sound processor (1) and the coil (2) can be combined into a single component that sits above and behind the ear. 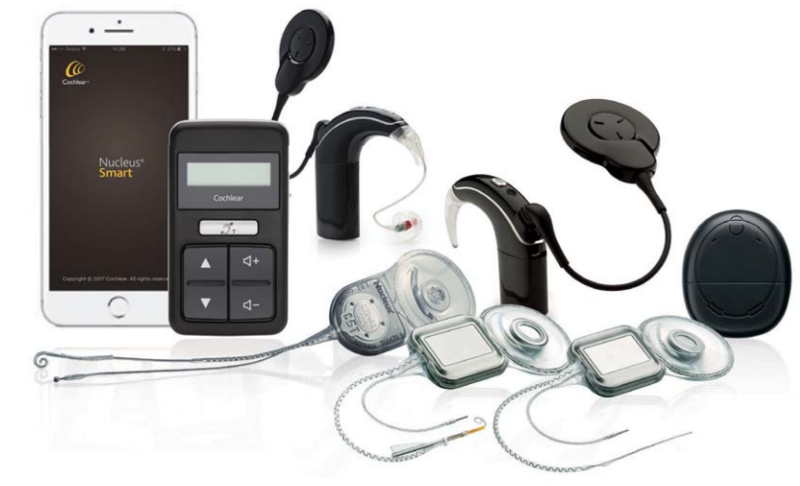 Cochlear implant systems come in a wide variety of configurations and component types. Accessories such as phone apps, control units, wireless microphones, phone clips and TV streamers are also available. Cochlear implant systems are individually tailored to each client. Factors determining component suitability include the specific nature of a client’s hearing loss and their physical attributes, as well as lifestyle needs and personality. A full diagnostic hearing test is undertaken by Mackay Hearing’s experienced Audiologist to determine the type and extent of hearing loss and your potential candidacy for a Cochlear implant will be discussed. A full candidacy assessment will then be carried out by our Audiologist in a separate appointment. If the assessment confirms your candidacy, a referral to an Ear, Nose and Throat (ENT) Specialist will be issued. The ENT Specialist will carry out various medical investigations and assessments to determine whether you are medically suitable for a Cochlear implant. Receiving a Cochlear Implant is a major procedure requiring extensive adjustment and ongoing support. Therefore, upon confirmation of medical suitability from the ENT Specialist, the next step is to have a comprehensive counselling appointment with our Audiologist. Implantation is carried out by the ENT Specialist in a hospital surgery. It is likely that the ENT Specialist will request post-surgery follow-up appointments. Upon clearance from the ENT Specialist, the device is ‘switched-on’ during an appointment with our Audiologist. After switch-on, regular appointments with our Audiologist are held so ‘mapping’ can be undertaken. Mapping is adjustments and refinements to ensure optimal hearing. Appointments can also involve counselling to assist the client adjust to the system. Mapping appointments may be necessary for a period of up to 12 months after switch-on, however the length and number of appointments required in the mapping period will depend on your progress adjusting to the system. Cochlear implant success requires much more than just implanting a device, switching it on and leaving you to your own devices. 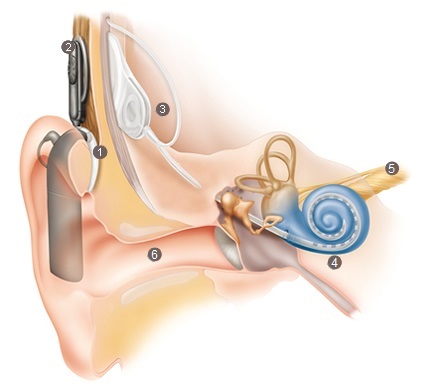 Cochlear implantation is a major procedure requiring extensive adjustment and ongoing support. After switch-on and comprehensive mapping, our Audiologist will conduct reviews annually (or more frequently if necessary). We encourage clients to attend our peer support group – Hear With You Mackay. We can also connect clients with local Cochlear implant recipients that volunteer their time to support and assist fellow recipients. Mackay Hearing offer medical rebates for all Audiological appointments directly related to Cochlear implants (candidacy assessment, pre-surgery counselling, switch-on, mapping and ongoing reviews). In addition, many Australian private and government health insurance plans cover the cost of Cochlear implants and Medicare can cover part of the surgery costs. If you would like more information on our Cochlear implant service, please contact our friendly local staff directly on (07) 4952 4649 or email us at listening@mackayhearing.com.au.